I spend an exorbitant amount of my time brainstorming new things to do with potatoes. They are just so darn versatile - what can't you do with them, is the question. I have to say this is one of my favorites. 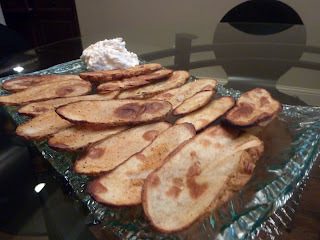 Thinly sliced potatoes roasted at a high temperature until slightly crispy, and served with a sour cream dipping sauce. Don't worry - these aren't 'wannabe roasted french fries' or those lame American fries they serve you at brunch. These are in a new category, and they are great. Preheat the oven to 450. Line a baking sheet with aluminum foil, and coat with a non-stick cooking spray. Lay the thinly sliced potato pieces in a single layer on the baking sheet. Brush each with melted butter, then sprinkle with your favorite BBQ dry rub (this is optional but highly delicious step). I used the same rub I used for BBQ ribs - it's just an all-purpose seasoning mix of paprika, cayenne, brown sugar, etc. Place the potatoes in the oven and roast for about 35-40 minutes. To prepare the dipping sauce, mix the sour cream, mayo, and cheddar cheese. If I had bacon, I would add that too!